As I visit more and more vegan restaurants, I feel the need to declare that I am not a vegan…..not even close. But, I say this because despite my love for dairy and meat, I continue to enjoy the meals I am having at vegan restaurants. And, Sun Cafe in Studio City is no exception. Sun Cafe has been in existence for five years. The first location, which they still own, is small and was more suited to prepared food-to-go. 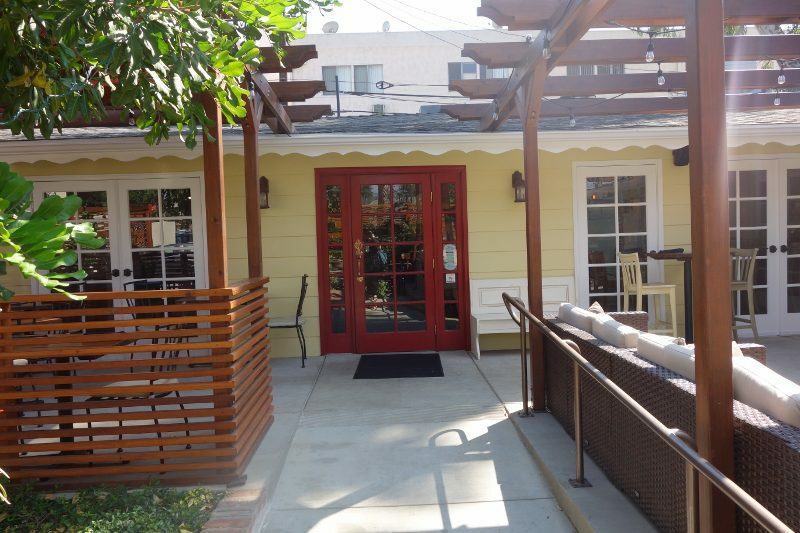 But, in their new larger location on Ventura Blvd, near Vineland, Sun Cafe is housed in a former 1920’s duplex. 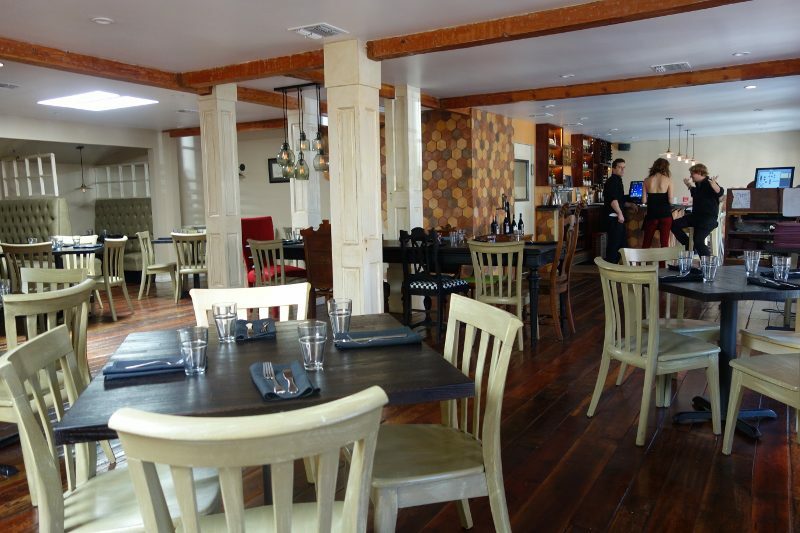 The space is bright and open and radiates freshness with lots of seating. Owners Ron and Rebecca live a raw and vegan lifestyle. They welcome everyone but don’t preach. Their goal is to celebrate food prepared in its natural state. The result is healthy food, full of flavor, that is not fried, killed or overcooked. 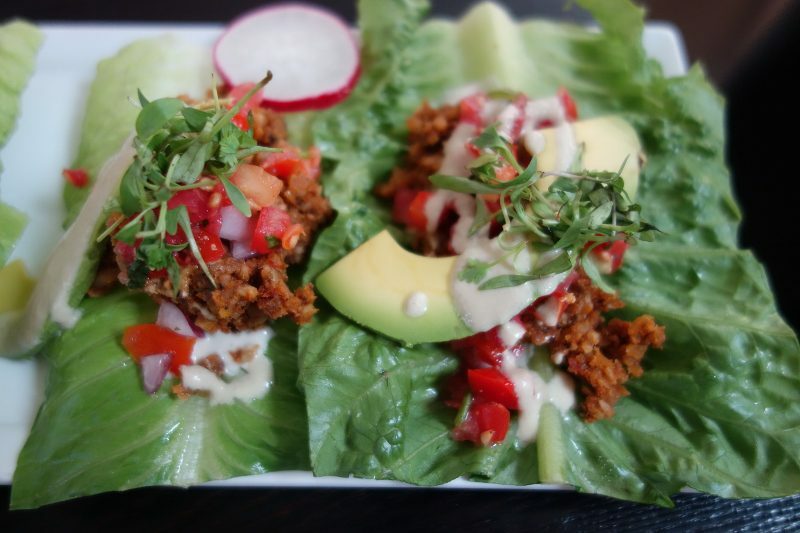 Favorite dishes include the crispy, crunchy fresh Lettuce Leaf Tacos with SunChorizo, cashew cheese, pico de gallo, avocado & basil ranch. Not only vegan, but a raw dish as well. 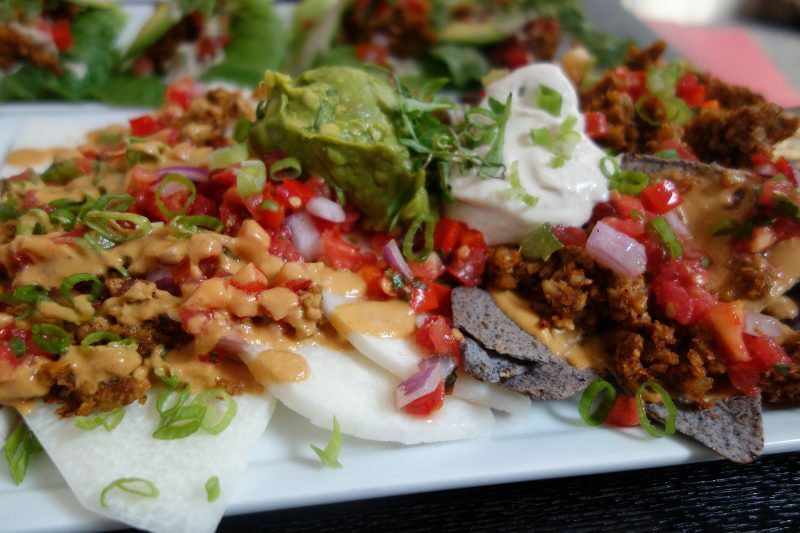 The Sun Nachos with SunChorizo, nacho cheese, guacamole, pico de gallo, jalapeño, green onion, cashew sour cream with choice of raw thin-sliced jicama “chips” or baked blue corn chips were another favorite. We did half baked (with chips) and half raw (with jicama chips). If you like jicama, the raw version is very flavorful. Farmer’s Market pizza with fresh figs, white sauce, tempeh bacon, arugula, meyer lemon vin, balsamic reduction has great flavor. 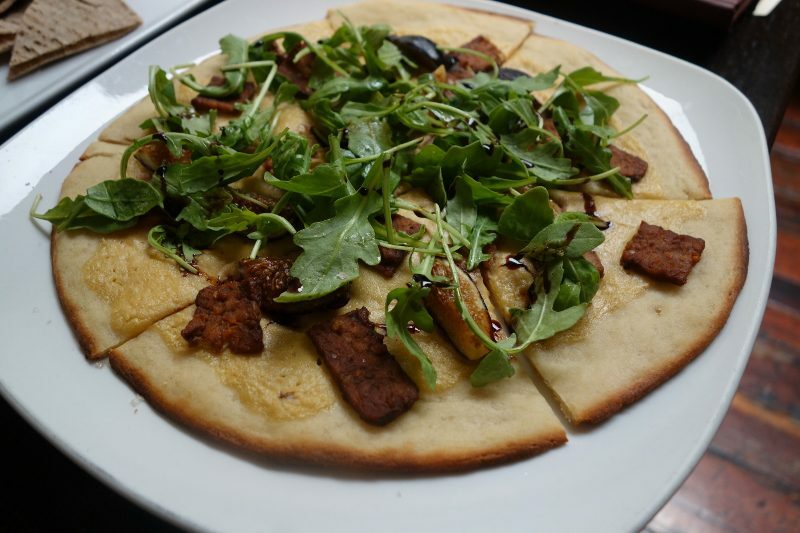 The sweetness of the balsamic reduction is lovely against the sweet figs and bitter arugula and the tempeh bacon is smoky and savory. The Mac & Cheese is made with quinoa pasta, tomato and cashew cheese sauce. 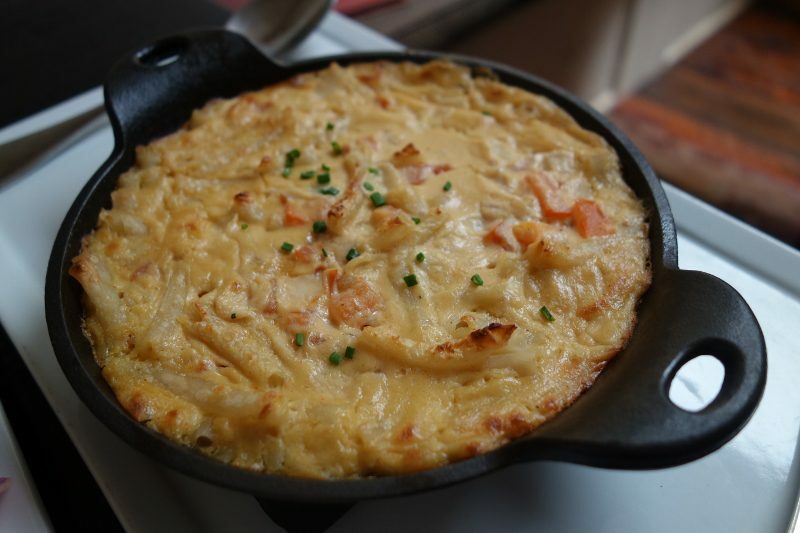 This is perhaps the healthiest Mac & Cheese you will ever have….and you will like it! The noodles are tender and light and the baked dish had a crispy cover and a creamy inside. 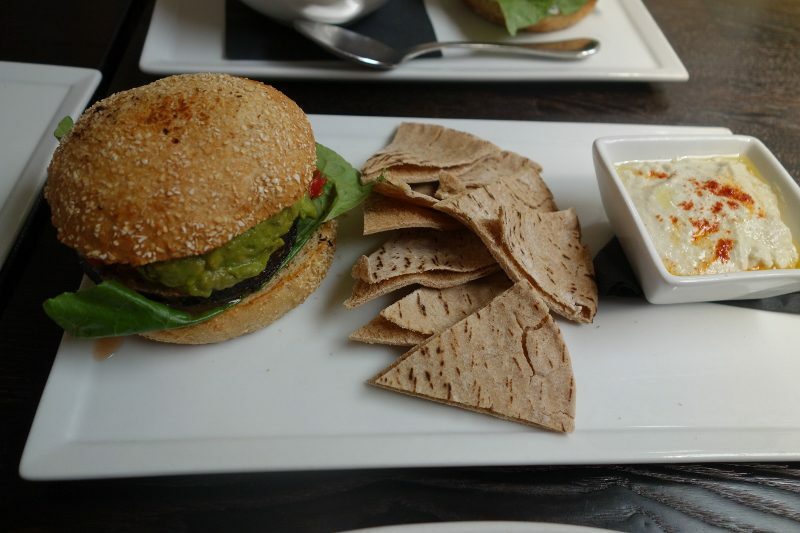 The Fiesta Burger is a SunBurger topped with guacamole, pico de gallo, nacho cheese, cashew mayo and jalapeno, served with hummus and pita. It was oozing with fresh avocado. 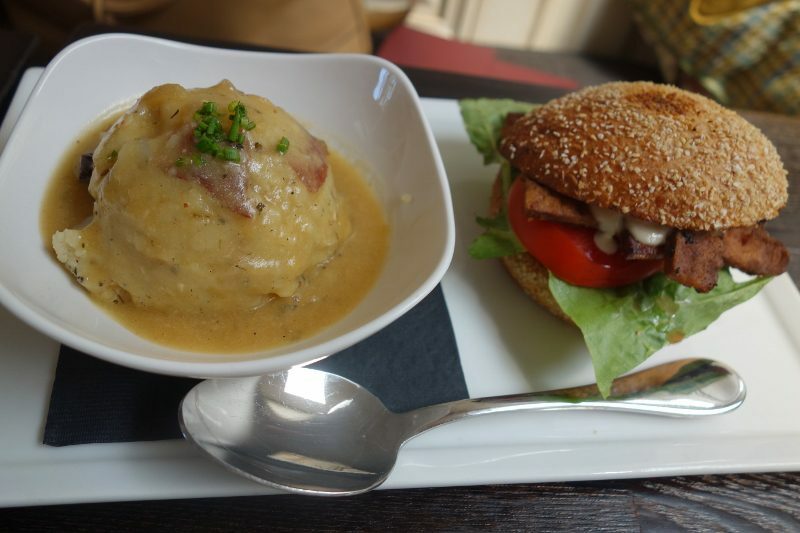 The BLT Sandwich is made with oat bread, smokey tempeh bacon, lettuce, tomato and cashew mayo. Recommendation…..add avocado! This was served with very tasty garlic mashed potato & mushroom gravy. Sun Cafe has a great selection of interesting wines that are sustainably or biodynamically produced. There are 18 wines by the glass and a total of 38 selections, as well as 9 craft beers on tap. You won’t go thirsty. As for desserts, the Key Lime pie was creamy and tart. The double chocolate cupcake and banana cupcakes were dairy free and gluten free. They are great if you are gluten free but for this gluten and dairy eater, this is the only place that I have to draw the line. The food at Sun Cafe is resonating with guests as I was told that more than half of the people that come to Sun Cafe are not vegan. 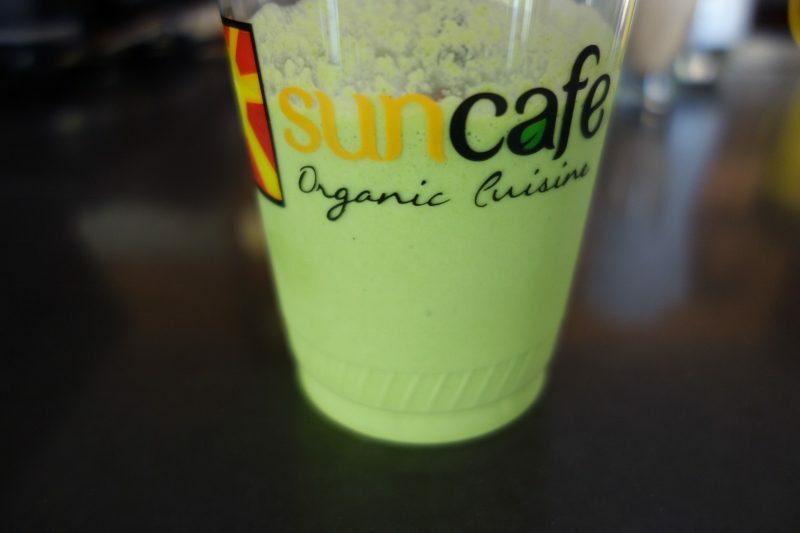 If you like healthy food, Sun Cafe is for you. 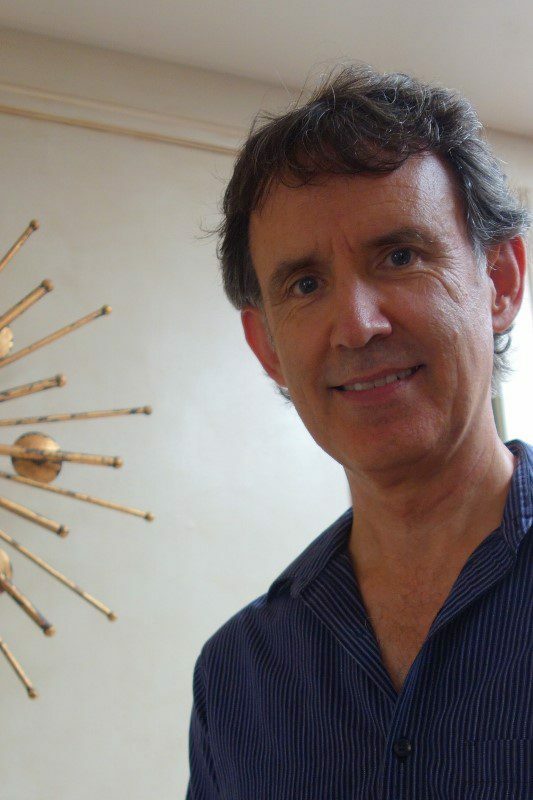 This entry was posted in Food, Lifestyle and tagged Ron Russell, Studio City, Sun Cafe, vegan by Allison Levine.